To take full advantage of digitized printed text, you need to put it into a form that allows searching. Pure conversion to bitmaps doesn't work. If the layout differs from the original, saving it as ASCII might be a way. However, if you want to preserve the original, PDF is the first choice for preserving the Optical Character Recognition (OCR) information. You can then search the text with a common Linux tool such as grep . Many GUI scanning and OCR applications have tools working in the background, including shell command versions. In this way, you can create your own tools that meet your needs, with the foundations coming from Scanimage and Tesseract. Both tools can be found in the Software Center or are just an apt-get install away on the command line. To begin, install the libsane and sane-utils  packages. It's not necessary to start the Sane daemon. In normal operation you need only bring up the program in a terminal. The package manager installation sets up a sane or scanner user in /etc/passwd in a corresponding group. 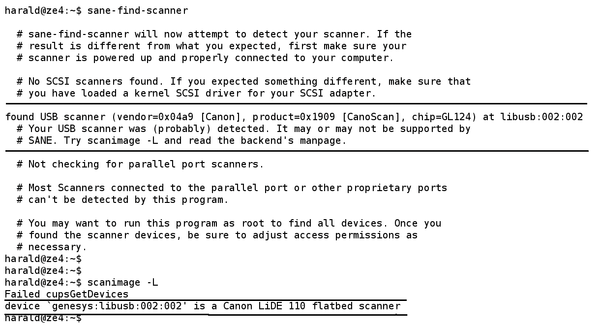 The instructions for Sane provide ample guidance as to which software supports a scanner. In some cases, you need to extract a Windows driver file and apply it to the Linux machine. Many newer scanners support Sane software directly. You can find a good description for installing a scanner on the web. During the scan, the status bar should move and the terminal output should show the results (Figure 2). Figure 2: If the configuration works, the test run should show a positive outcome. If everything works up to this point, the hardware integration is complete. You can find the most important scanimage options in Table 1. If you have a scanner with an automatic document feeder (ADF), the scanadf tool is worth a shot. 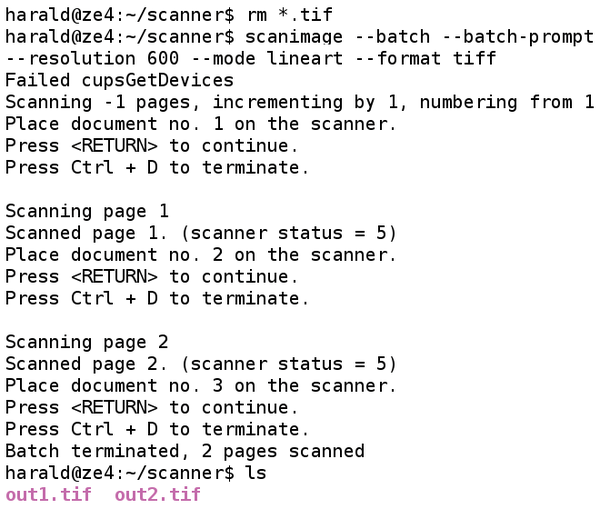 Figure 1: Searching for and finding the connected scanner with sane-find-scanner and scanimage -L.
Now all that's left is to convert the TIFF file to PDF format. Finally, the script creates a PDF file from the result of the OCR run and combines the two documents. The result is a PDF file that you can search using pdfgrep or the viewer. The scanimage call in line 12 prepares for batch processing. The number of scanned pages remains open. You enter each line followed by Enter. To abort the process, use Ctrl+D. In the example, I needed to do that after two pages. The filename begins with 10000 , so you can avoid errors in sorting the filenames that subsequently appear. Creating the scans with a resolution of 600dpi is useful when the originals contains unreadably small type; the scans should be black and white. The script saves the image files in TIFF format (Figure 3). 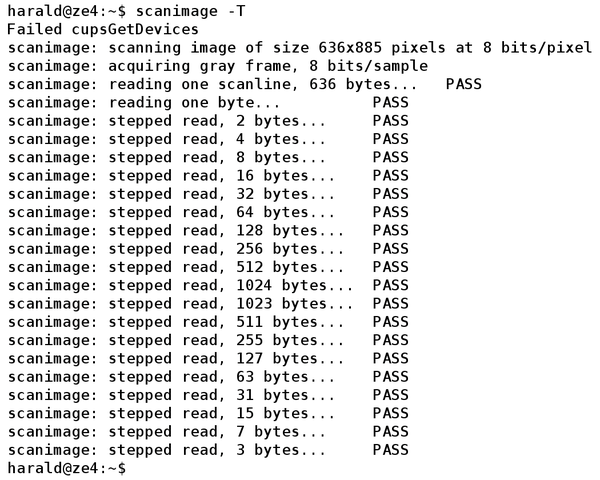 Figure 3: The scan output is in TIFF format in this example. Some older models work especially slowly with a resolution above 600dpi. These devices often read the pages piecemeal and stop to save them before moving on. This delay might lead you to think that Scanimage has hung, with the only solution being to kill the process, but that's not the case. The progress indicator (specified with the -p option) gives you the bigger picture. Only when the indicator has not changed over the course of some minutes (Figure 4) should you abort the process. Furthermore, my test required the -d <device> option, because redirecting the output would have returned an error message about CUPS devices not being found in the target file. Figure 4: The progress indicator helps with older scanner models to get a better idea of how the task is going.